Soprano Erin Bardua is a frequent concert soloist, who has performed with the Talisker Players, Nota Bene Baroque Players, Pax Christi Chorale, the Toronto Sinfonietta, the Oshawa-Durham Chorus, the Arcady Baroque Ensemble, the St. James Cathedral Choir, Capella Intima, London Pro Musica and the Menno Singers, among others. Her oratorio repertoire includes Handel’s Messiah, Esther and Judas Maccabaeus, Zelenka’s Missa Omnium Sanctorum, Beethoven’s Mass in C Major, Vaughan Williams’ Hodie, Haydn’s Creation, Mozart’s Requiem and Vesperae solennes de confessore, Bach’s Magnificat and Passions, Saint-Säens’ Christmas Oratorio, and Vivaldi’s Gloria. Erin is the co-founder of Essential Opera, a concert opera company performing great works in Ontario and the Atlantic. Her operatic roles with EO and other companies have included Nannetta (Verdi’s Falstaff), Antonia and Giulietta (Offenbach’s Les contes d’Hoffmann), numerous Mozart including Pamina (Die Zauberflöte), the Countess (Le nozze di Figaro) and Donna Anna (Don Giovanni), Alcina (Handel), Constanza (Haydn’s L’isola disabitata) and Elena (Gluck’s Paride ed Elena). Erin has also premiered leading roles in several new compositions, including Frankenstein by Andrew Ager, Regina by Elisha Denburg, Etiquette by Monica Pearce, and Heather: Cindy + Mindy = BFFs 4EVER by Christopher Thornborrow. 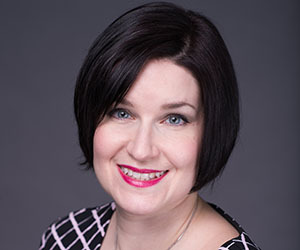 Erin has provided dramatic coaching and stage direction for Mount Allison University’s Opera Workshop and the Halifax Summer Opera Festival, where she directs The Coronation of Poppea for the 2018 season. She operates a private voice studio in Sackville and is a regular festival adjudicator. Erin is represented by Knowles Artists.